Konichiwa! 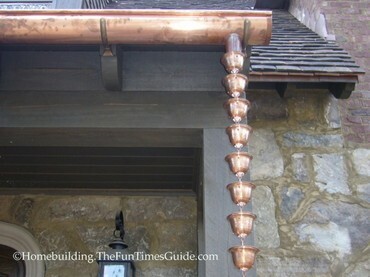 A copper rain chain connected to the downspout by the front porch really caught my eye on my latest visit to the English cottage-style home near Marietta, GA. I had never seen a rain chain before, but apparently they are of Japanese origin and are known as kusari-doi in Japan. They’ve been around for hundreds of years and have been utilized for their architectural and functional qualities. I guess I shouldn’t be surprised to find yet another unique feature on this extraordinary home being built. Have You Seen Any Rain Chains? Rain chains, a.k.a. 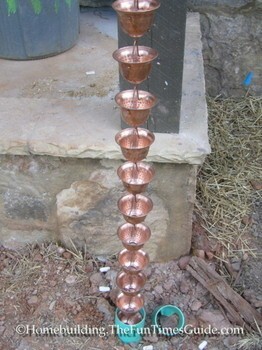 rain cups, have a zen-like quality to them and may mesmerize you as you watch and listen to the water cascade downward through the cups. Think of it as a way to lower your blood pressure. They’ve just recently begun to catch on in the U.S. as a decorative alternative to regular downspouts. Rain chains have been featured recently in articles in home magazines and also on The Discovery Channel’s “Monster House” episode of The Loft House. Keep your eyes open because you are likely to see them more often in the coming years. They vary widely in price — depending on the style and length — but count on around $18-$25 per linear foot for rain chains such as the the type I have pictured here. Rain chain installation is a cinch! Just place the bracket through the drop outlet, then hang the rain chain on the bracket. You might just find yourself praying for rain with hopes that you’ll be able to see it in action right away. Be sure to hang it in a drop outlet that is located where you are able to view it during a rain storm — such as near a front or back porch. I was driving by the English cottage on my way home from work one day when it happened to be raining. It wasn’t a downpour, just a really nice Spring rain. I pulled into the neighborhood to take a video with my trusty digital Panasonic camera, because I had been waiting for this exact opportunity. Up to that point, I had never tried to turn the camera vertically, which is what I did to get the full effect of the length of the rain chain and the beautiful sounds emanating from it. I was all excited about it and rushed home to load it into the article I posted here. Of course, you probably know the end to this story…the video was sideways on the screen so I could not use it to share with you all. Bummer! If you find this article interesting, you may want to check out the whole series of posts on this English-cottage style home to see all of the beautiful craftsmanship and materials that have gone into constructing it. This English cottage is one of the finest examples of planning, craftsmanship, quality materials, and a dream realized that I have ever witnessed. Do yourself a favor and take your time looking at the posts if you love beautiful homes.